Time for another week of meal plan ideas. This time I put together a week of Grab and Go Meals for you. So many of my readers are busy during the week and I wanted to give you some healthy options that you could eat on the run! Most of these recipes are easily portable and many can be eaten with one hand! Hopefully you’ll find some delicious new ideas! Customize with your favorite fruit. Toss them in the microwave for a few seconds before you head out the door or eat them cold! A fun, yet nutritious breakfast for those busy mornings with the kids. Quinoa’s not just for dinner! Try it in place of oatmeal for a quick breakfast. Let this cook while you get ready, wrap in foil and eat it during your commute. Easy to make several ahead of time and throw in your lunchbox all week. Packed with protein and healthy fats, this can be eaten with just one hand. Use cheese to help everything stick together, then eat freshly cooked or make ahead of time and eat cold or reheat. Drink up for a protein-packed, satisfying meal. A fun change on a traditional sandwich. Slap it on a bun or wrap it and lettuce and eat on the go! No huge pans or serving spoons needed! Perfectly portioned and easy to grab when you head out the door. Change up the fillings to fit your taste preferences. Stock your freezer and then just reheat and go! Mix everything in one dish, spoon into a tortilla and wrap in foil to make it easy to hold and eat! 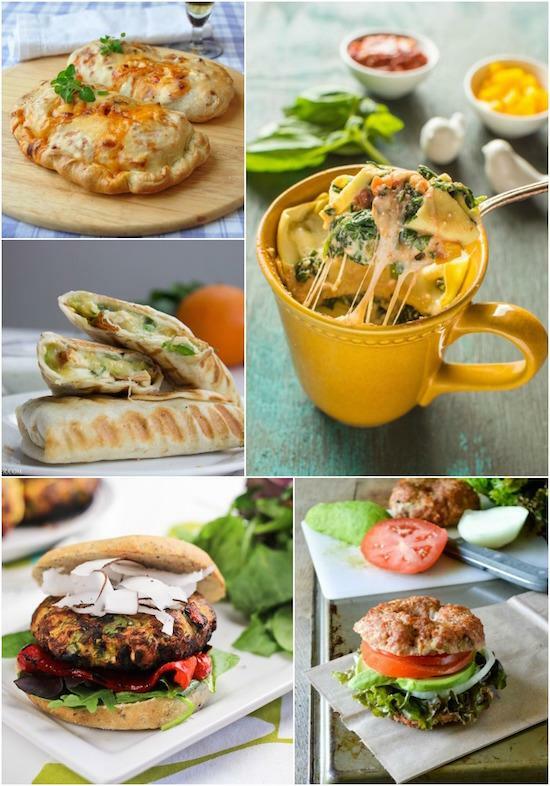 Looking for some food prep ideas for the recipes in this meal plan? Make a batch of banana pops and freeze them. Make a double batch of oatmeal cups and freeze half for another week. Prep a batch of breakfast cakes. Cook the quinoa for your parfaits. Cook chicken to use in the mason jar salads and pitas. Prep a couple of mason jar salads for lunch. Make a batch of sweet potato waffles to have on hand to make sandwiches. Bake or grill some chicken burgers. Prep and freeze some pizza calzones. Cook the chicken, rice and beans for burritos. Have a busy week ahead? 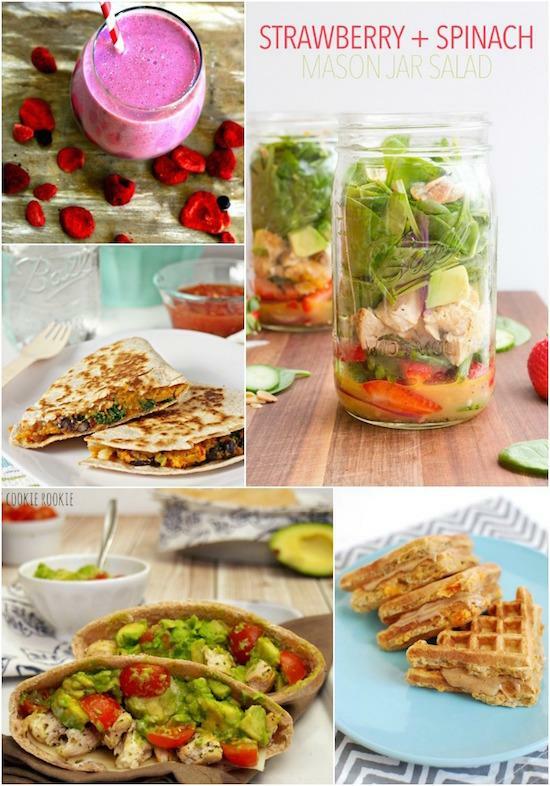 Here are some grab and go meal ideas from @leangrnbeanblog! think you can come make these for me today? I’ll make the smoothie of course. haha. And bring squish! Spinach ricotta lasagna in a MUG??? So creative and looks SO yummy. Whoa! Lasagna in a mug! That’s a new one. OMG I need these! I’ve been struggling with figuring out what to eat on the go lately. Thank you for all these great ideas! Hold up? Lasagna in a mug? GENIUS! This is awesome! 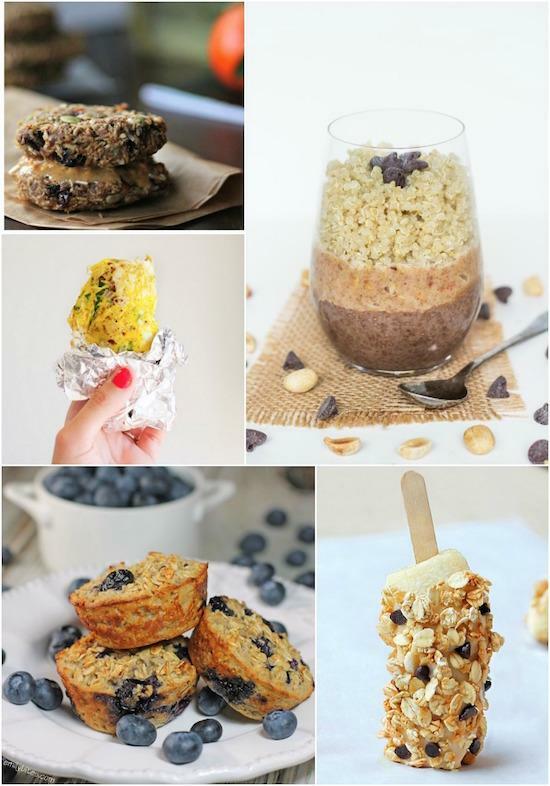 It’s so nice to see actual healthy recipes that can be eaten on the go! Plus, they all look incredible! I love all the ideas … especially that lasagna in a mug! Too cute and healthy, of course! These are so great.. I just pinned for meal planning soon. I’ve been on the run all the time lately, it’s so nice to not worry about the time to put together a meal! !